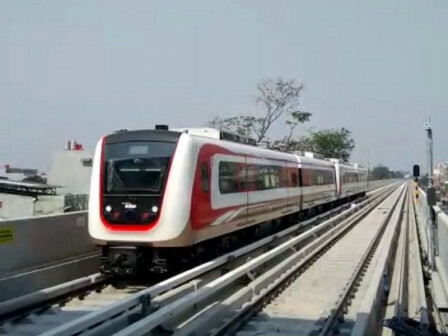 City-owned construction company PT Jakarta Propertindo (Jakpro) will conduct a limited operation test on two LRT trains of Jakarta Phase I Kelapa Gading-Velodrome on Wednesday (8/15).
" We'll test two LRT trains with route Kelapa Gading-Velodrome on August 15"
"We'll test two LRT trains with route Kelapa Gading-Velodrome on August 15," expressed Dwi Wahyu Daryoto, President Director of PT Jakpro, Monday (8/13). He explained that it would be carried out by machinists and given a limited passenger load. Ahead of the trial, his side still continues to conduct static and dynamic trials, as the trial needs 2,000 hours. "During Asian Games, LRT operational is also still limited," he stated.